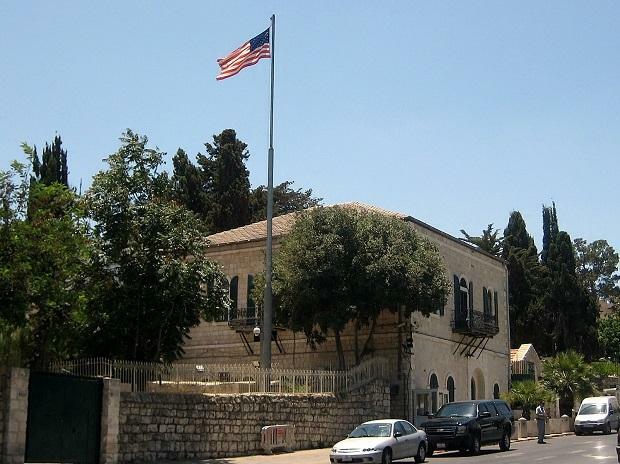 The United States has officially shuttered its consulate in Jerusalem, downgrading the status of its main diplomatic mission to the Palestinians by folding it into the US Embassy to Israel. For decades, the consulate functioned as a de facto embassy to the Palestinians. Now, that outreach will be handled by a Palestinian affairs unit, under the command of the embassy. The symbolic shift hands authority over US diplomatic channels with the West Bank and Gaza to ambassador David Friedman, a longtime supporter and fundraiser for the West Bank settler movement and fierce critic of the Palestinian leadership. The announcement from the State Department came early Monday in Jerusalem, the merger effective that day. "This decision was driven by our global efforts to increase the efficiency and effectiveness of our diplomatic engagements and operations," State Department spokesman Robert Palladino said in a statement. "It does not signal a change of U.S. policy on Jerusalem, the West Bank, or the Gaza Strip." In a farewell video addressed to the consulate's Palestinian partners, Consul General Karen Sasahara, who is leaving her post as the unofficial U.S. ambassador to the Palestinians and will not be replaced, maintains that new Palestinian unit at the embassy will carry forward the mission of the consulate, "in support of the strengthening of American-Palestinian ties, to boost economic opportunities for the Palestinians and facilitate cultural and educational exchanges." When first announced by U.S. Secretary of State Mike Pompeo in October, the move infuriated Palestinians, fueling their suspicions that the U.S. was recognizing Israeli control over east Jerusalem and the West Bank, territories that Palestinians seek for a future state. Palestinian official Saeb Erekat called the move "the final nail in the coffin" for the U.S. role in peacemaking. The downgrade is just the latest in a string of divisive decisions by the Trump administration that have backed Israel and alienated the Palestinians, who say they have lost faith in the U.S. administration's role as a neutral arbiter in peace process. Last year the U.S. recognized Jerusalem as Israel's capital and relocated its embassy there, upending U.S. policy toward one of the most explosive issues of the Israeli-Palestinian conflict. The Palestinians in turn cut off most ties with the administration. The administration also has slashed hundreds of millions of dollars in humanitarian aid to the Palestinians, including assistance to hospitals and peace-building programs. It has cut funding to the U.N. agency that provides aid to Palestinians classified as refugees. Last fall, it shut down the Palestinian diplomatic mission in Washington. The Trump administration has cited the reluctance of Palestinian leaders to enter peace negotiations with Israel as the reason for such punitive measures, although the U.S. has yet to present its much-anticipated but still mysterious "Deal of the Century" to resolve the Israeli-Palestinian conflict. Trump's son-in-law, Jared Kushner, announced last month that the U.S. would unveil the deal after Israeli elections in April. The Palestinian Authority has preemptively rejected the plan, accusing the U.S. of bias toward Israel.